Metal detecting and fieldwalking on this site since the 1980s have recovered numerous objects dating from the prehistoric to the post medieval periods. A large number of the finds, which include coins, building materials and metalwork, have been attributed to the Roman period, and it is thought that this concentration of objects may indicate the presence of a Roman settlement. Other interesting artefacts include a Neolithic scraper, Bronze Age and Iron Age pottery sherds, as well as fragments of a medieval quern. 1980. Fieldwalking and metal detecting. Iron Age and Roman sherds, Roman building material, Roman metalwork, very few coins. Pot boilers. Roman coins and brooch, (S2). Pot boilers. Roman coins, sherds and metalwork. 1988. Metal detecting. Finds over about 4.5 ha. Roman coins and metalwork, Iron Age sherds. List and drawing (S1) in file. E. Rose (NAU), 4 November 1988. Before January 2005. Contexts 1 and 6. Iron Age and Roman sherds. Post medieval and undated metal objects. A. Rogerson (NLA), 31 May 2005. Roman pottery, building material and metalwork suggests that there was probably a Roman settlement on this site. D. Robertson & A. Rogerson (NLA), 13 December 2005. <S2> Illustration: Wallace. P. M.. 1983. 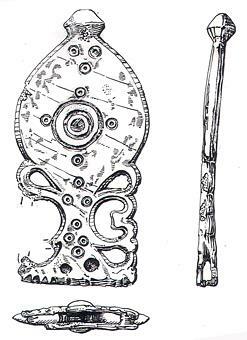 Drawing of a Roman bronze brooch foot plate.. Film. 2:1.